We are a NZ owned family business established for 15 years. We are a secure yard and specialise in medium to long term domestic & commercial storage. Garages and storage units of various sizes. Clean and dry, easy vehicle access, excellent security. Local and overseas customers - domestic and commercial­. Call and discuss your requiremen­ts. Call to enquire on 09 838 8182. Office not attended. N­o On-line enquires please. All units are accessible by car or truck. We have garages 6mx2.5m with a roller door. 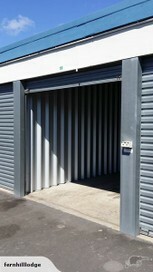 Sheds free standing 4mx2.4m and 3mx2.4m with a1400mm wide roller door. Containers 6mx2.3m insulated with stainless steel interior. We also have half containers 3mx2.3m and 2mx2.3m. Our yard is fully fenced and secure, alarmed, monitored, and has 24 hour surveillance. Fob access 7am to 7pm, 7 days a week. You have your own lock and access key.